The current transformation of many Eastern European societies is impossible to understand without comprehending the intellectual struggles surrounding nationalism in the region. Anthropologist Katherine Verdery shows how the example of Romania suggests that current ethnic tensions come not from a resurrection of pre-Communist Nationalism but from the strengthening of national ideologies under Communist Party rule. 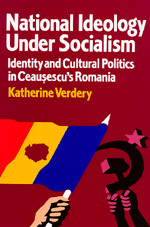 Katherine Verdery is Professor of Anthropology at the University of Michigan, and the author of Transylvanian Villagers (California, 1983).